We all need to know where we come from. Through generations links are being created between members of different families. It is like a woven piece of fabric : couples came together, they broke up, people are dying, new alliances are formed … Sometimes we can follow our family history sometimes not. Stripes from two different fabrics are woven together : they represent the alliances among families. The stripes are fused on the batting. One fabric is rusted, the other one is hand dyed : they represent past and present. A vintage block is appliquéd on the top : it is the impact of the past in our lives, our memories. Bits of shredded paper (family documents) are spread over the background and represent the fragility of our destiny. They are aged with inktense pencils and waxed. The quilt is machine and hand quilted. Material : cotton muslin, printed paper, inktense pencils, wax, hand dyed thread. Beautiful work Chantal. I like the idea and how it took shape and the combination of handdyed and rusted fabric. Very nice muted colour palette. The shredded papers give it an extra dimension. The colors you used are beautiful as ever. 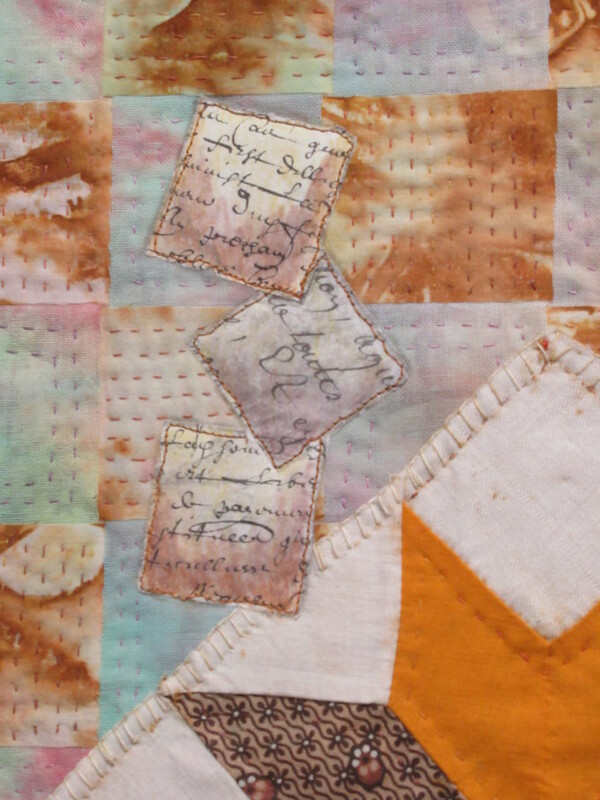 Good composition and the part of paper makes this quilt very special. Magnificent work. Excellent interpretation of the theme. The range of colours, the whole material, the composition and the realization; they manage to create a feeling of nostalgia and love. Chapeau! Beautiful Chantal! This carries a lot of thoughts and emotions. Your interpretation is fantastic. What a brilliant idea, and how well you have executed it. I love the way that you have built up the image so thoughtfully, and the papers add a really touching element. A very nostalgic effect is created by your choice of this gentle colour scheme and the papers add extra interest. Love the story and your interpretation of past and present interaction is very thought provoking. Wonderful colours! 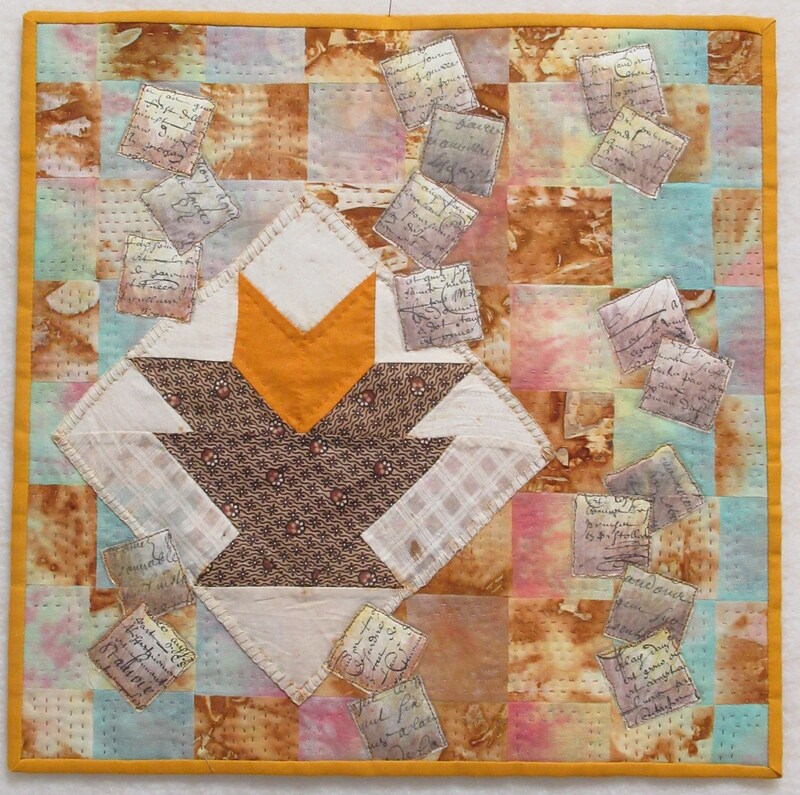 The way you talk about family, relations, future and past, is translated beautiful in your quilt. Serenity and care are the words I think of looking at it, very special. What a warm and touching idea. Love the colors, the details and the shredded documents makes it so personal and so special. Warm and pleasing to look at. Great attention to detail. Makes me think of matzoh chips. What a lovely piece. 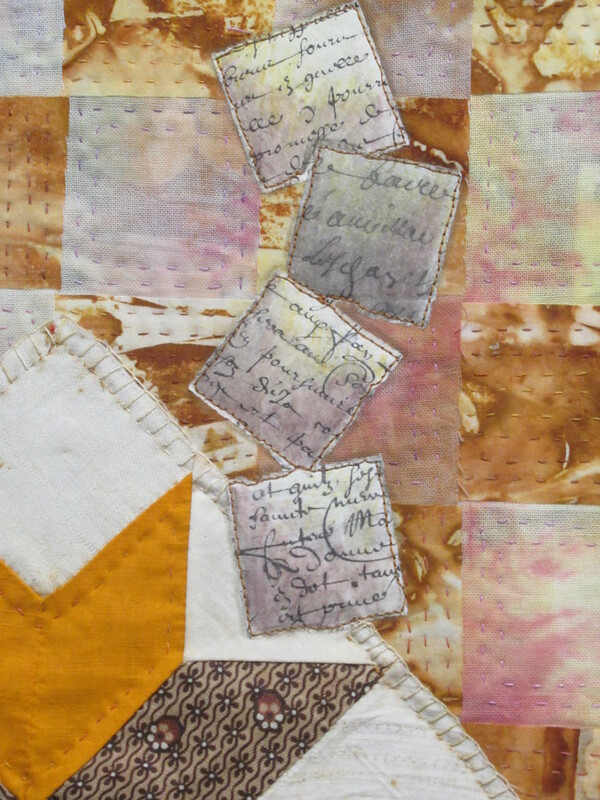 It has an “old fashioned” gentleness to it conveyed by the central block and colour scheme, yet an artistic feel from the background which includes rusted fabric and hand written paper. The parts work well together to create a seamless whole.